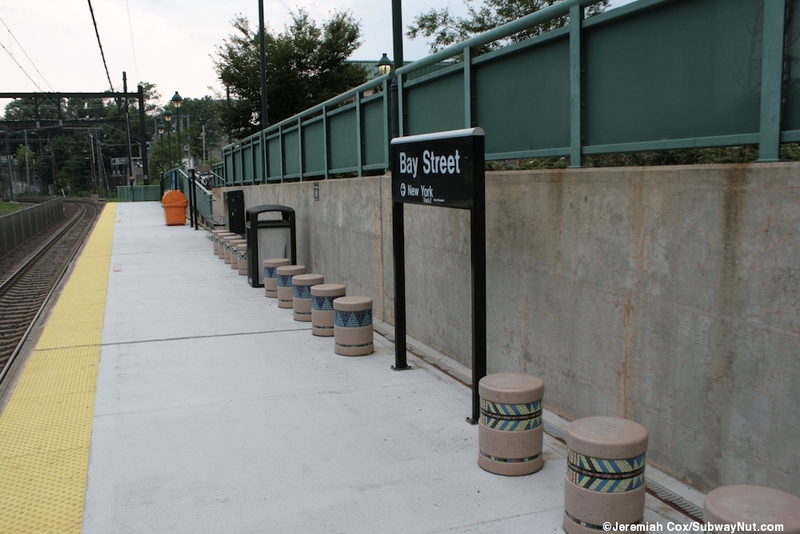 Bay Street Station is the southernmost station in Montclair and opened on February 27, 1981 to replace the historic Lackawana Terminal in downtown Montclair (presently a shopping center, one block away). 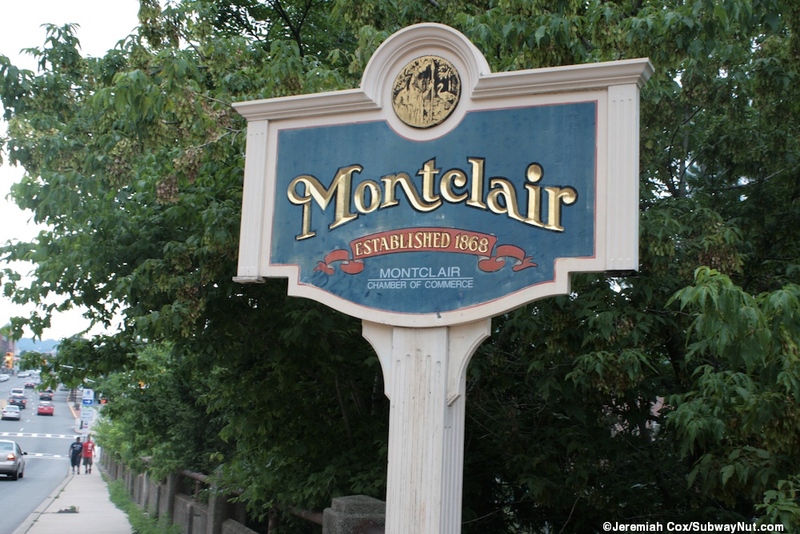 It has been electrified since its opening by Conrail and originally was the simple one track terminus of the Morris & Essex Lines' Montclair Branch. 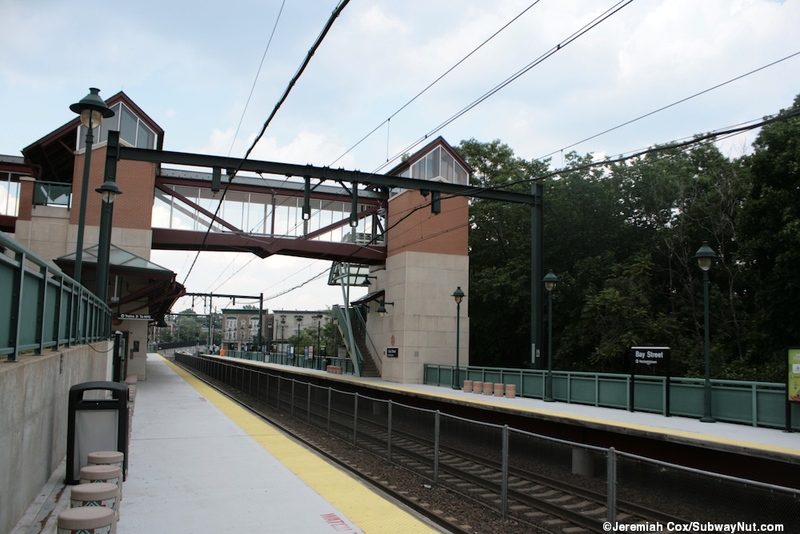 The station was rebuilt into today's modern two track high-level platform as part of the Montclair Connection that built a connection between the Montclair Branch and the Boonton Line and through service began (with the two high-level platforms completed) on September 30, 2002 that saw the debut of Midtown Direct Montclair Trains, a one seat ride into New York and also extended electrified rail service to Montclair Heights (and then Montclair State University when that station opened in 2004). 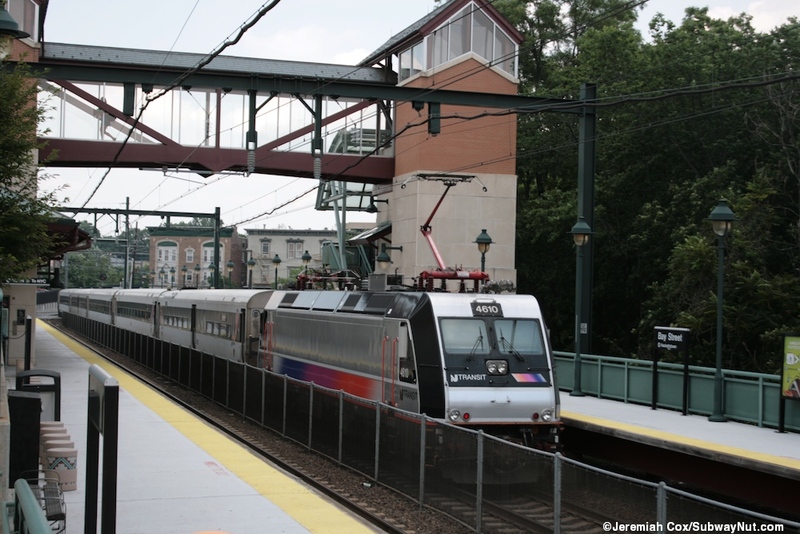 No stations on the modern Montclair-Boonton Line (except Dover and Denville, the end of the Morris & Essex electrified service) have ever had weekend service during the New Jersey Transit era. 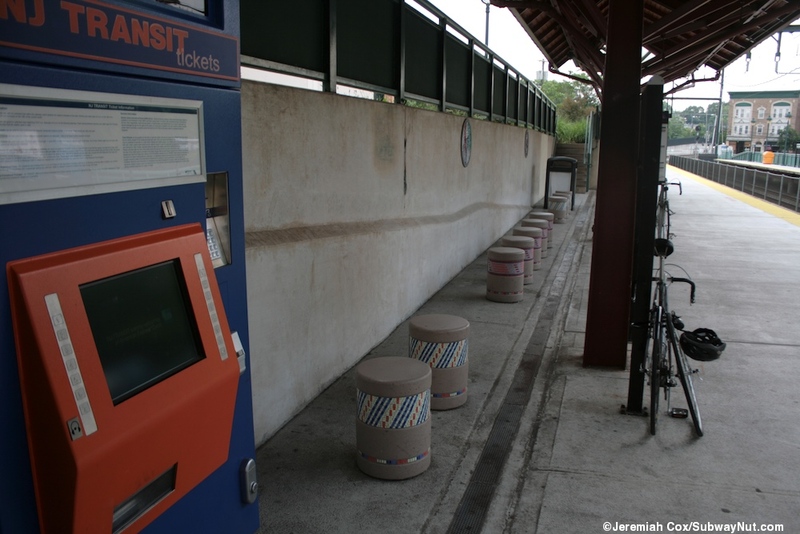 This changed on September 30, 2009 when the station became a terminus again. 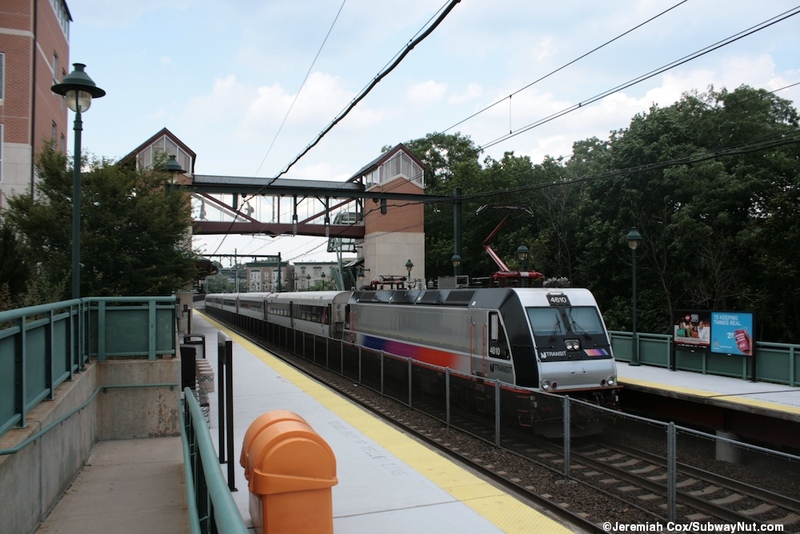 Limited weekend service now runs on the Montclair-Boonton Line running every two hours from Hoboken terminating at Bay Street only stopping at the three intermediate stations on the branch (Glen Ridge, Bloomfield, and Watsessing Avenue) and connecting with Morris & Essex Lines Midtown Direct service at Newark-Broad Street for Penn Station. The station has two high-level platforms for two tracks (with a fence between them) with low green fencing along all edges (that aren't concrete walls) and all ramps and staircases. The platform lampposts are also green. 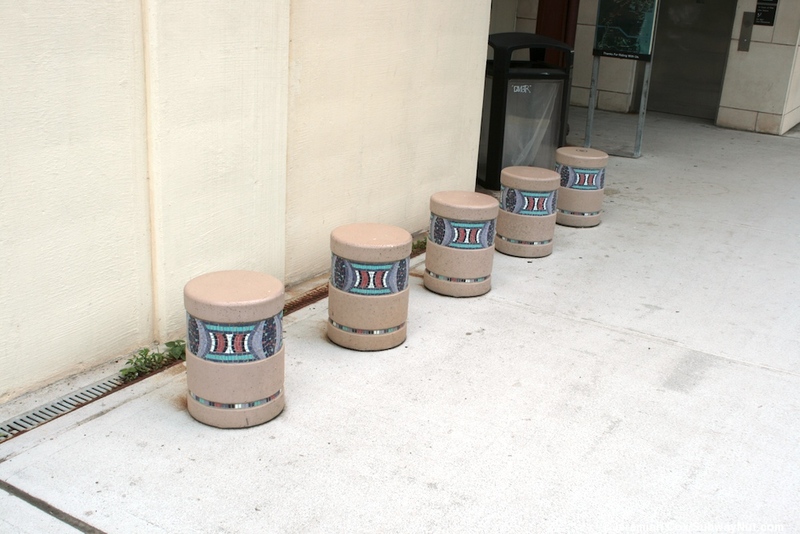 The platforms have unique circular concrete stools for benches, these have mosaic bands by Judith Wadia with Native Indian Patterns. 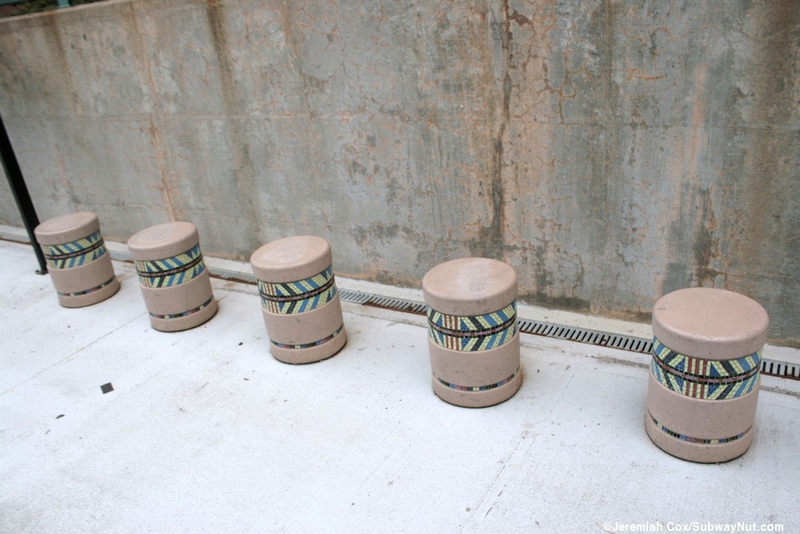 This also includes circular mosaics on the concrete walls of the platform and elevator shafts. 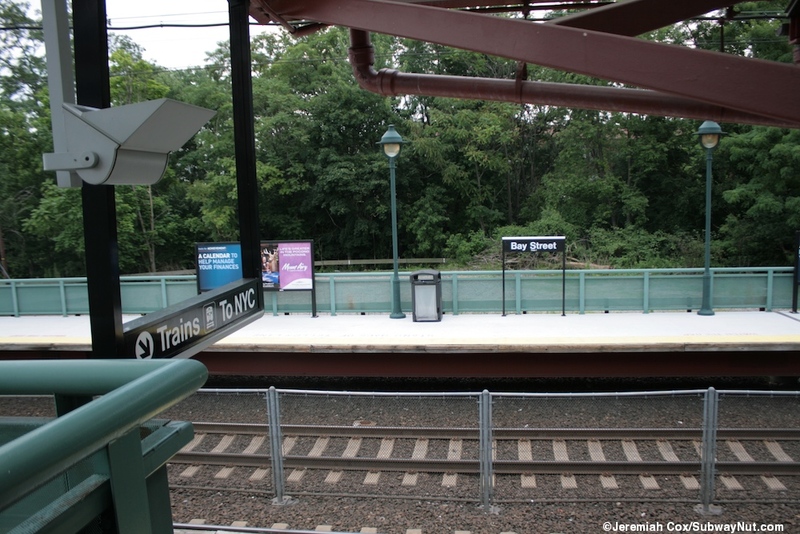 The Newark-bound platform has a canopy for about two train cars. This is where the stations only two TVMs are. 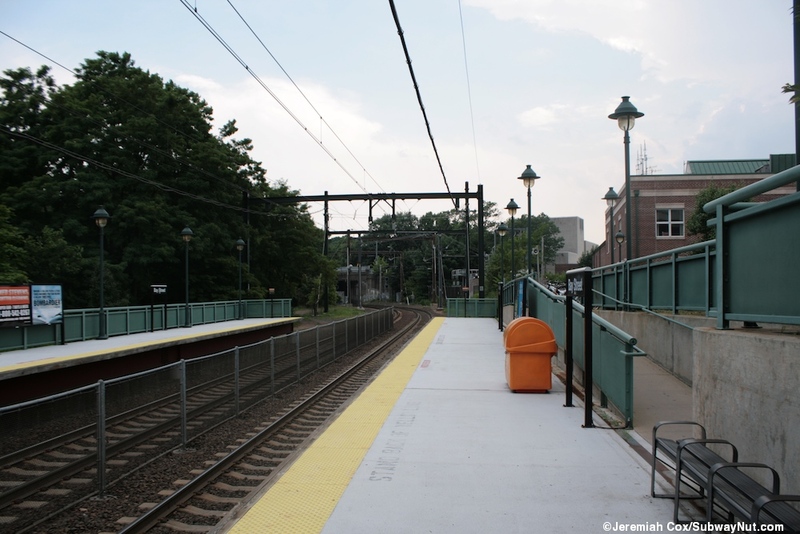 The Hackettstown platform has only the overpass for protection from the elements. 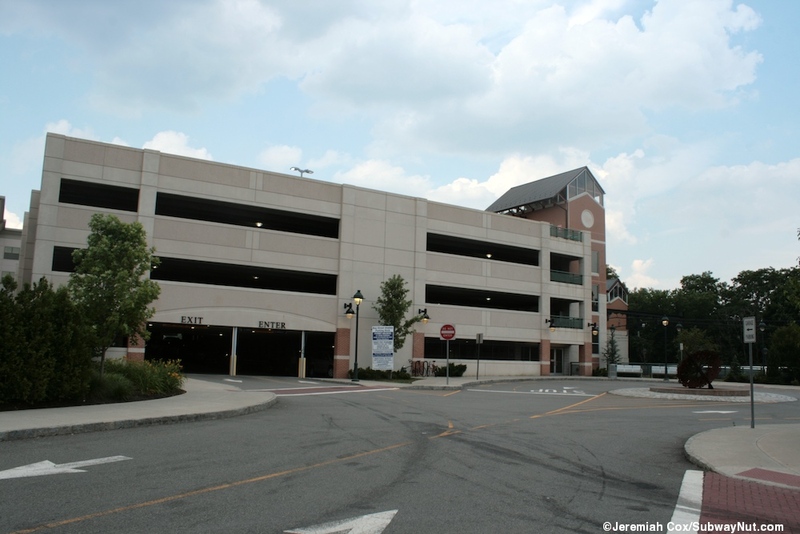 The main station entrance is from a four-level, 240 space parking garage. This modern garage has its main entrance from a driveway from Pine Street that includes a circular Kiss'N'Ride loop. 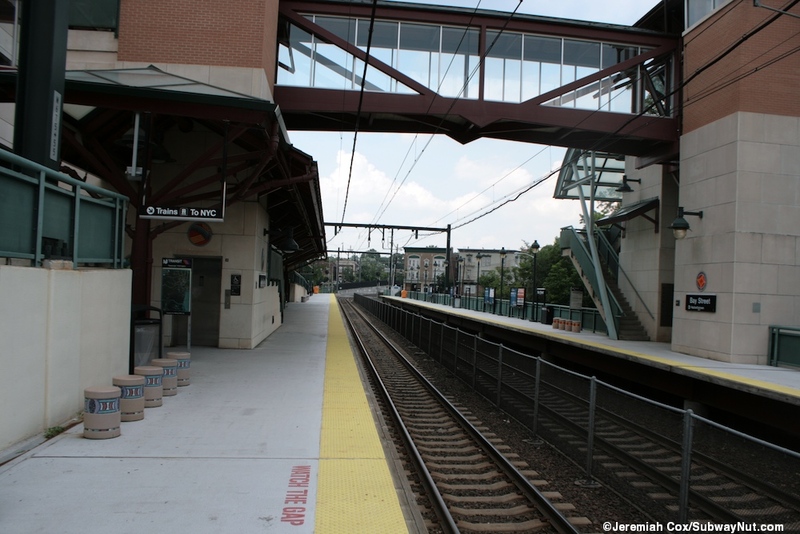 From this a ramp leads directly down to the Newark-bound platform. 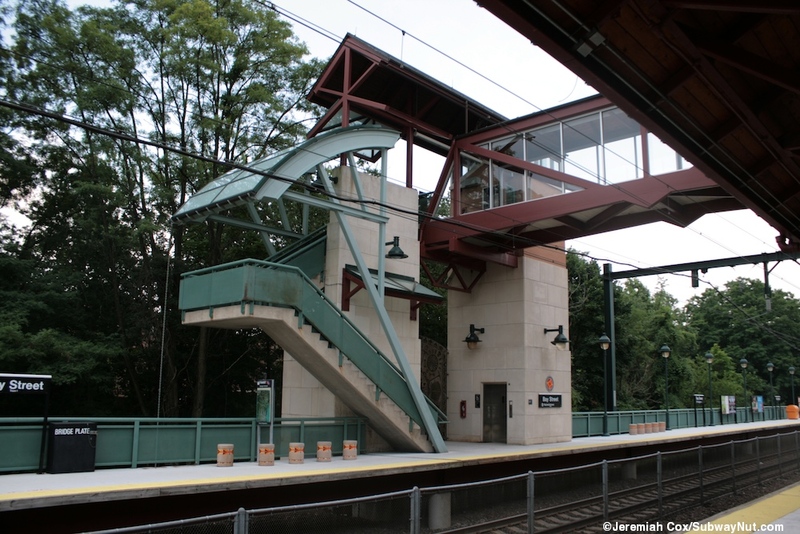 A glass pedestrian overpass leads from the third floor of the parking garage to a staircase and an elevator (with a concrete, with brick accents shaft) down to each platform. 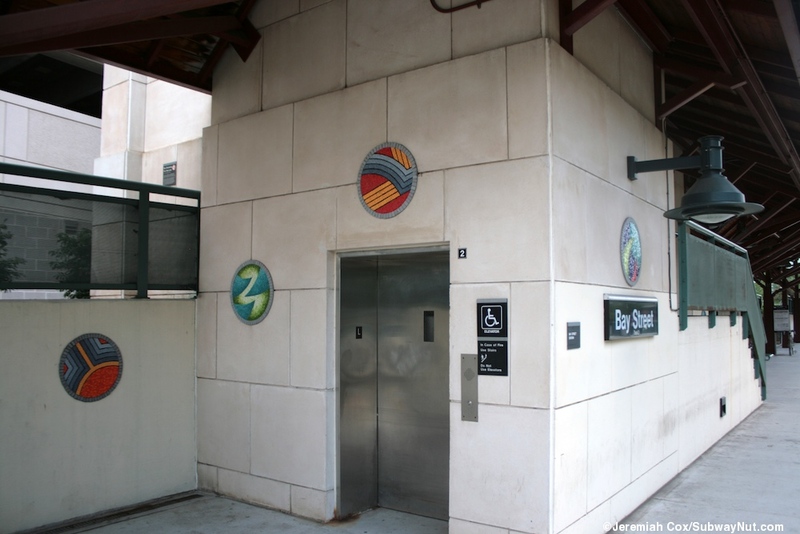 The elevator to the Newark-bound platform makes an intermediate stop at the first level of the parking garage. 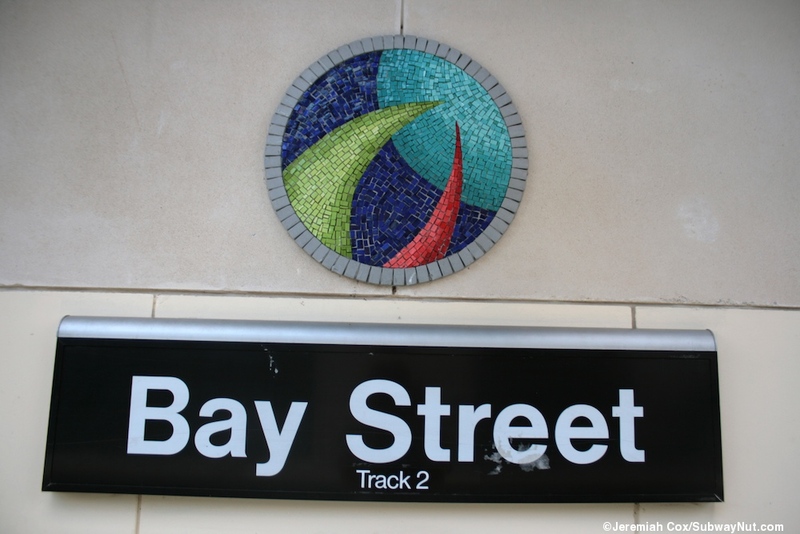 This overpass has a unique decorative floor with accents of color, 'Jazz Walk,' Dichroic Glass Jewels by Ray King. 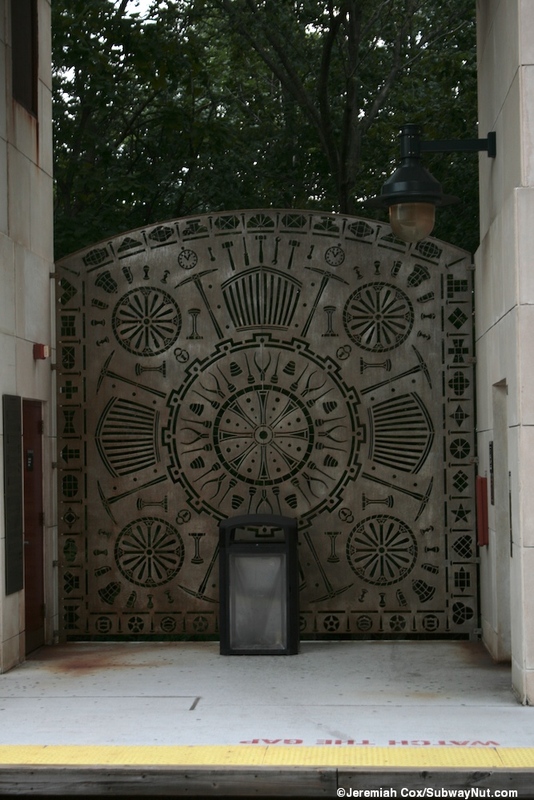 Between the staircase and the elevator on the Hackettstown-bound platform is a stainless steel sculpture Train Time by Tom Nussbaum depicting objects found in train and train stations. 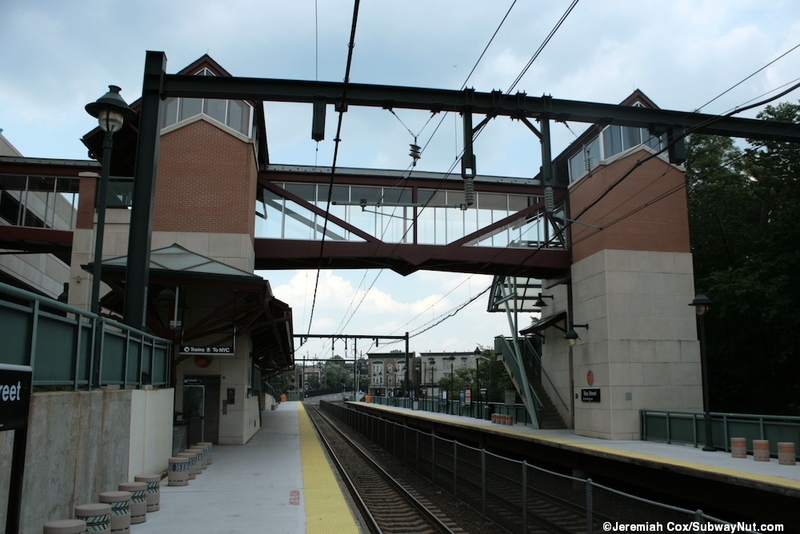 The Newark-bound platform has an additional staircase at the northern end of the canopy that leads up to the first floor of the parking garage. 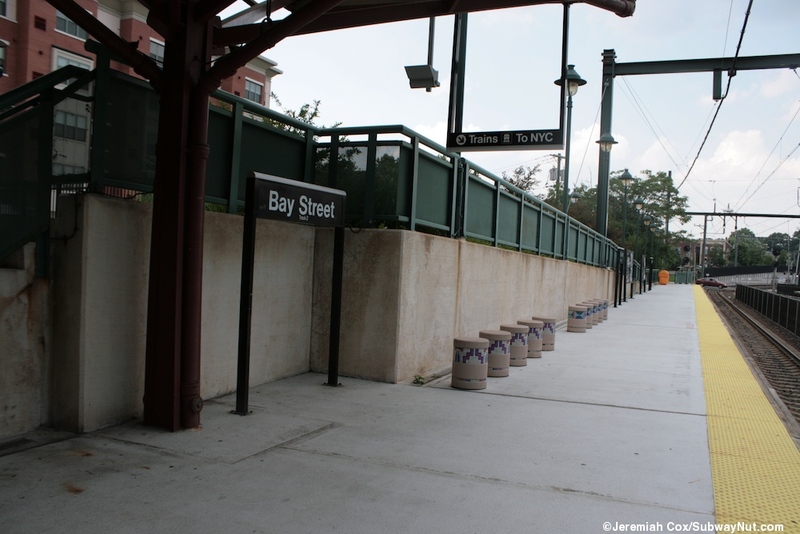 Both platforms have a ramp down to track level at their northern end, this leads to short walkways up to the grade crossing with Glenridge Avenue. 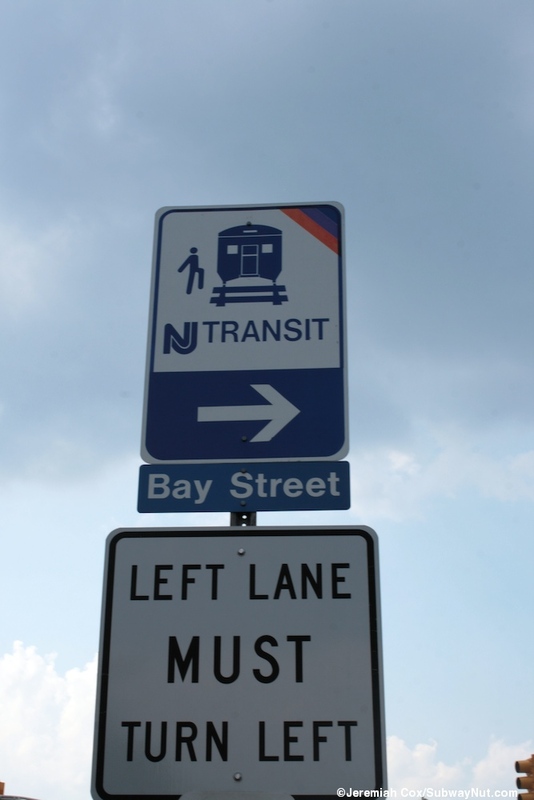 Namesake Bay Street ends at a T with Glenridge Avenue just before this crossing. 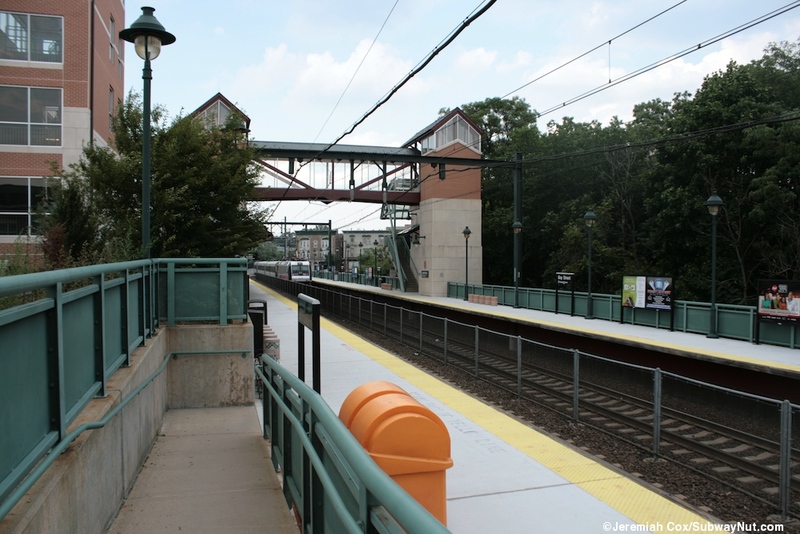 This grade crossing is also the first one (Hackettstown-bound) on the Montclair-Boonton Line and was only opened in 2002, as go on the quarter mile of new track before joining the now freight only branch that was the Boonton Line.